scans_daily | Dazzler #13 - "Trial... and Terror!" 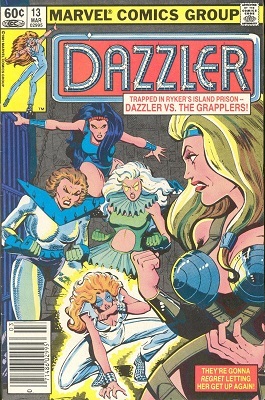 I remember buying this, not so much because of Dazzler, but the Grapplers were an interesting thing, an all female supervillain team. And of course, Screaming Mimi (Definitely my favourite name of the team) is now Songbird, so it just goes to show you can never tell who is going to go places. According to the Old Father's Wikipedia, this is one of Screaming Mimi's earliest appearances. Which explains the evil ballet Pierrot thing she's got going on. It's kind of amazing she ever lasted long enough to be cool. IIRC The Grapplers first showed up in Marvel Two in One, raiding "Project Pegasus"
Ah Dazzler. A super-hero soap opera to rival no others. Those early days were so gloriously weird. The good girl art (check out how she sleeps in prison, and how her top gets progressively skimpier until she's practically falling out in places), the overwrought prose (and GO FOR IT!) and of course all the "women in prison" cliches you could ever want. I love how the Grapplers get full costumes and makeup for this. Also never 4get "Because you demanded it! The last issue of Dazzler!" I have the essential dazzler comics but i wish for a color omnibus. Ugh the graphic novel where she gets with the ugly old dude and cuts her hair is the WORST. I can never forget that guy's name. Roman Nekoboh. Because it's Namor Hoboken backwards. Super gross and yeah I get that it can happen to pop stars today but......how did she not realize? How did any of his prosthetics ever fall off? Something about that relationship was jarring to read in a Marvel Comic when I was a kid.